With warm and welcoming hugs Jasons’ family welcomed us into Germany and showed us all their favorite places in this fabulous country. 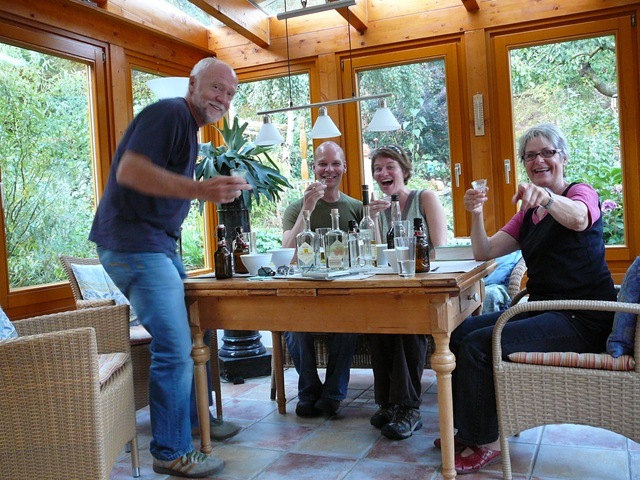 It was nice to stay in a family home, eat home cooked meals and have the planning done for us…we relaxed right into it and enjoyed it thoroughly. 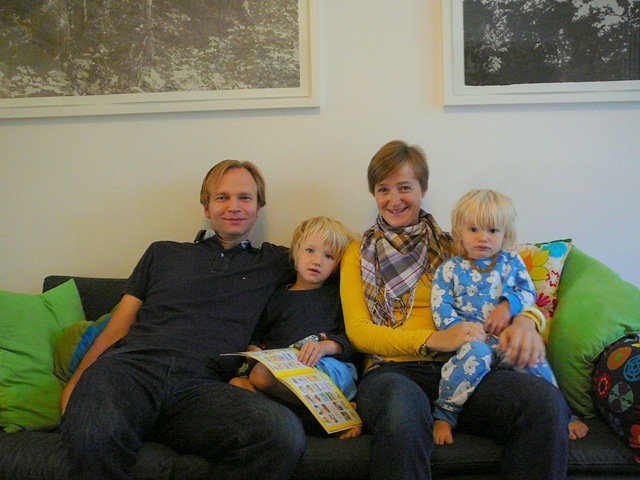 First stop was Hanover where J’s second cousin Heiko lives with his wife Jana and their two young boys, Fridtjof and Thees. Lonely Planet says that the only reason to visit Hanover is for the annual tech fair that occurs there, but I disagree whole-heartedly. Heiko showed us around his city, visiting new and old areas, stopping in at various art shows and galleries along the way. Our own wandering showed a city with a good mix of old and new architecture (more new than old as the city was leveled during the war), with lots of pedestrian walkways, lakes and parks to relax in. It’s not be a city that has big sights to see, but instead is a city that takes time to relax into and discover. I enjoyed it and loved spending time with the family – the boys cracked me up and as the weekend progressed I realized more and more how much alike J and Heiko are…looks, mannerisms, interests…I had not thought that second cousins could be so much alike. Our next stop was Seesen where Frank and Heike were jumping up and down with excitement on the train platform as we arrived. We were quickly whisked back to their beautiful backyard (complete with Canadian flag in our honor) to immediately sample some of the local brew – what a welcome! 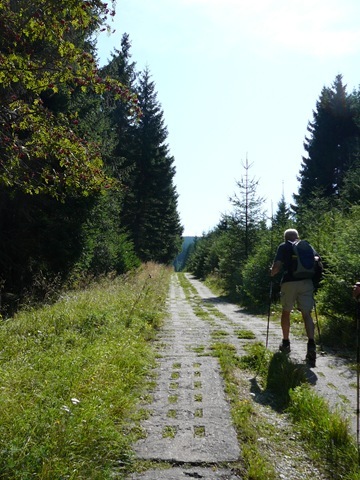 The following day they took us on a hike to the Brocken, the highest mountain in the Hartz Mountains. It was a beautiful hike (complete with a beer stop at the ‘ranger station’) into an area of the mountains that has only been accessible since reunification. The tank tracks we walked along were a constant reminder of the border patrols that used to occur in this area and from the top we could see for miles and miles – it was stunning. Beer and currywurst were the reward at the top before we hiked the 2.5 hours back down. Frank and Heike also took us to visit the 1000 year old city of Goslar. Located not too far from Seesen, it was a nice drive through the country to get there. Goslar was extremely pretty and, being a UNESCO Heritage Site, is well preserved. They knew of all the best, and secret places and we had a wonderful time there. Our time in Seesen came to an end all too quickly, but Berlin was waiting and we were looking forward to it, and our apartment, there. Our last stop in Germany took us to the small town of Friedberg, where another warm welcome awaited us. 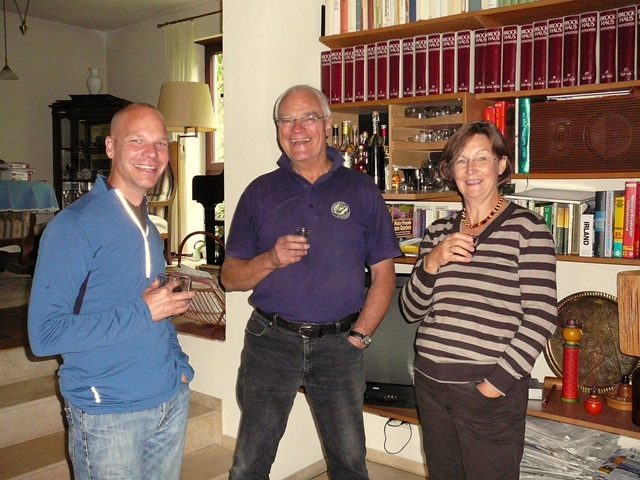 Hanno and Annette welcomed us into their home and showed us around even as they prepare for their own big trip to Tunisia, Libya and Egypt. It was great to hear about all their past travels and the plans for this next one. Our first full day there saw the weather clear just enough to warrant a visit to the Andechs Monastery. The walk to the monastery was nice…through fields and meadows with great views…and the monastery itself is a stunning example of a typical Bavarian Baroque church…but it’s the beer they brew here that was the real draw! 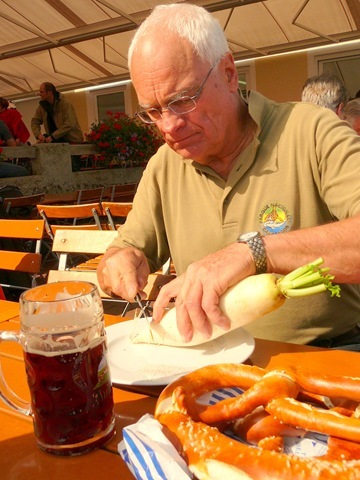 Smooth, dark and strong – it is the perfect accompaniment to the traditional pretzels, radish and pork shank that we also enjoyed. 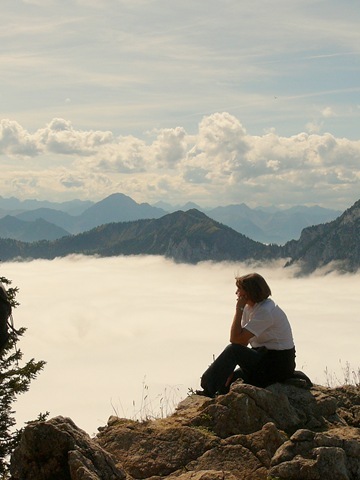 It was back to the mountains the next day for a visit to the German Alps and a fairy tale castle. The clouds were lying low that day but we headed up the cable car anyway hoping to break through on the way up. Within 100M of the top we could see the sun start to shine and then ‘pop’ we were above the clouds and within the peaks of the Alps. To say the view was stunning would be an understatement. With mountains as far as I could see and a puffy cloud layer below, the view was mesmerizing. 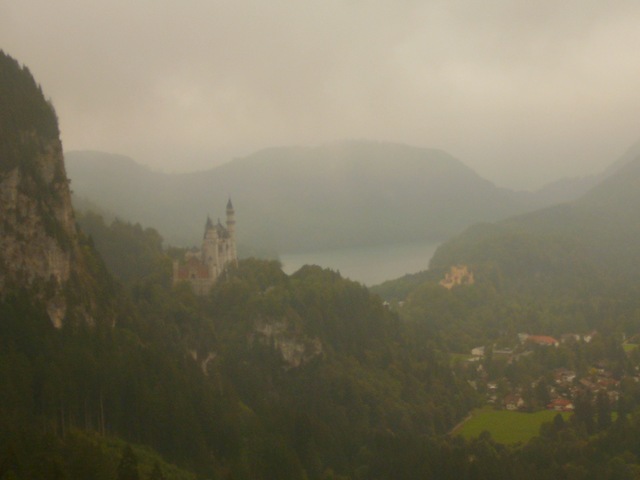 We hiked down through the clouds and valleys, traversing across a bit to reach Neuschwanstein Castle – the very castle that Walt Disney is said to have modeled Disneyland on. It truly is a like a fairy tale…rising up out of the mountain with turrets and walls and a grand demeanor. In the distance lakes dotted green, green valleys and small villages with their red roofs added to the fairy tale setting. It would not have been surprising to see Cinderella or Snow White here. It sounds cheesy I know, but it was very ‘once upon a time…’. The inside was, as Annette says, ‘very kitsch’ but fabulous all the same…what else would I expect from a fairy tale castle? We had dinner that evening high upon a mountain across the valley where we had fabulous views of both Austria and Germany. A fabulous end to a great day. And then there was Oktoberfest. 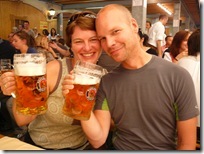 Our last day in Germany spent in Munich watching lederhosen and dirndl dressed men, women and families enjoy the largest beer drinking party in the world. It was absolutely huge! At least nine ‘tents’, each holding up to 7,000 beer-swilling partiers and that doesn’t count the thousands out in the grounds wandering around. Amazing! 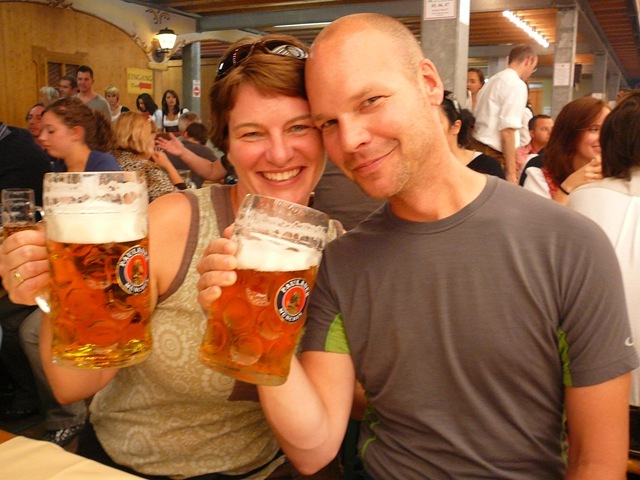 We had a good time and thoroughly enjoyed our huge 1L beers (although I could have done without the hangover for the flight to Istanbul the next day!!). We loved our time in Germany and, certainly, the warmth, generosity and hospitality of J’s family made it all the better. There is nothing like the warm embrace of family to make time go by all too quickly – we will have to return to spend more time and see more of this beautiful place. Thanks to all of you who took us in, served us your amazing food and beer, and showed us your favorite places – we loved it! !